I can hardly believe that it is almost September. Well…until I look at our sad tomato plants. Then I can believe it! 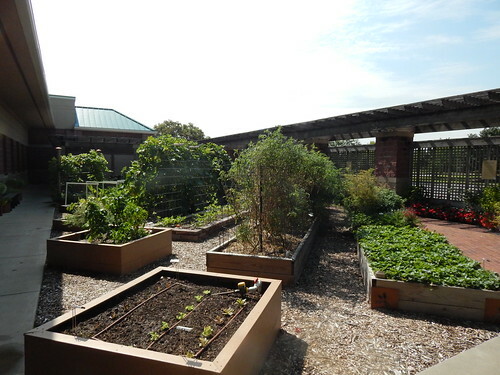 The overnight temps are also cool enough that we decided to go ahead and plant some of the lettuce this week. Overall, everything still looks like a jungle in the garden. 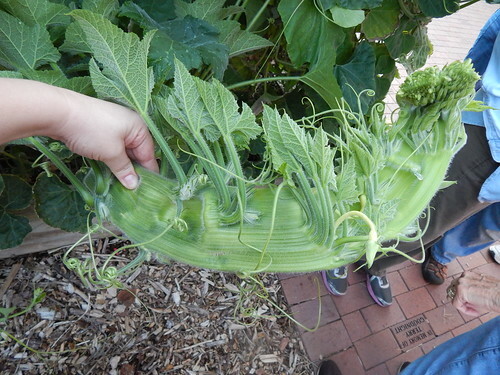 The fascinating fasciation on the squash vine I showed you last week continues to develop. It could be pretty neat to see how much crazier the end of the vine gets before the end of the season. Our peppers have been pretty pitiful this year, so I’m trying not to judge any of the varieties overly harshly. 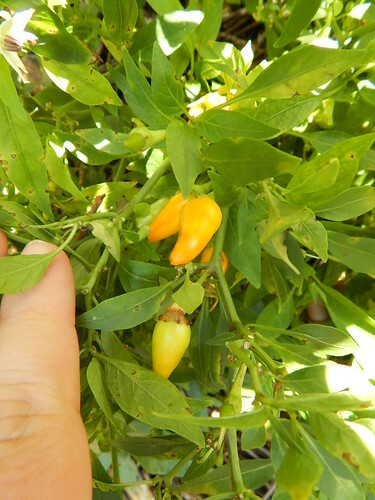 This is the ‘Sweet Sunshine’ that was billed as an “edible ornamental.” It was supposed to look like an ornamental pepper, but the peppers were supposed to taste like the sweet snack peppers. It is just barely beginning to set fruit, so it isn’t nearly as attractive as an ornamental. The peppers are tiny, and while the flavor is good, each pepper is about half a bite. It’s just not worth it! 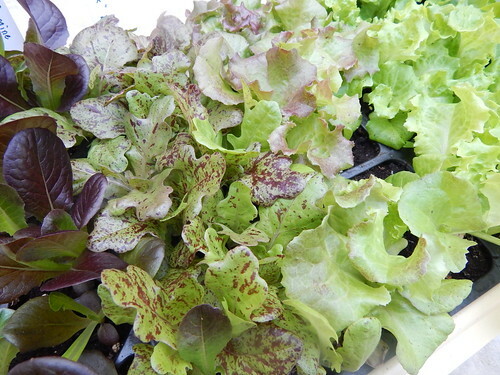 We planted the lettuce seeds 3 weeks ago, and the plants are looking good! I have some new lights in my office, and everything looks great. We planted some of the transplants out in the tallest raised bed where we had potatoes earlier in the year, with the theory that the rabbits can’t get to them. We are going to try some type of rabbit fence to keep them out of the lower beds. This is (surprisingly) the first year we’ve had a rabbit problem in the garden. We’ve had squirrels in the past, but they don’t care about the lettuce. 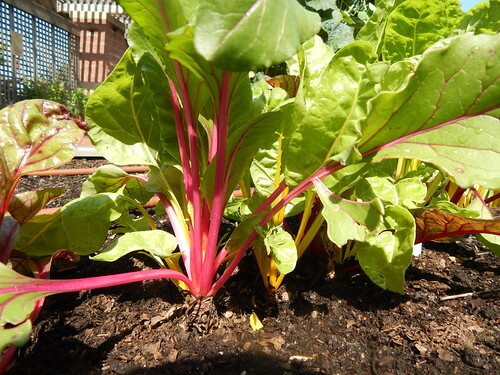 We’ve had Swiss Chard in the garden all year long, and I’ve barely taken a single picture of it. For those of you that are long-time readers, you will know how impressive that is. We’ve been harvesting it regularly, so it has stayed more at the salad size than getting bigger into the “cooking” size. The leaves have also stayed very clean and disease free, considering the amount of rain we’ve had. I would guess that the regular harvesting combined with the plants being pretty isolated in a spot with good airflow has really helped. We replanted the beans 3 or 4 weeks ago as well, and it is interesting to see the differences in growth and germination. One variety didn’t even come up! The ‘Carminat’ pole bean pictured here has really taken off and grown well. 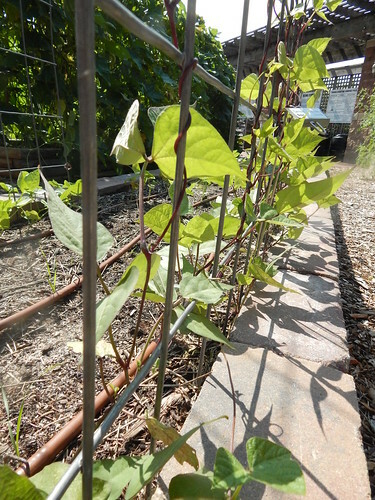 The ‘Blue Lake’ pole bean on the other side of the trellis really hasn’t started climbing yet. I’ll be surprised to see if we get many beans before it gets too cold. Posted on August 28, 2015, in PhotoEssays and tagged beans, fall, lettuce, peppers, squash, swiss chard. Bookmark the permalink. Leave a comment.